-Scatter some flameless LED tea lights around your home for a cozy ambiance. -Decorate special events, LED faux light dinners with your loved one, wedding parties and use as wedding favors. -Use them with your floral centerpieces. 2.Size: Diameter 3.6cm/1.4inch+ Height 3.3cm/1.25inch. Homemory- is a registered trademark protected by the US Trademark Law. Homemory products are sold by authorized sellers only. Each Product has its own package with Homemory Logo. 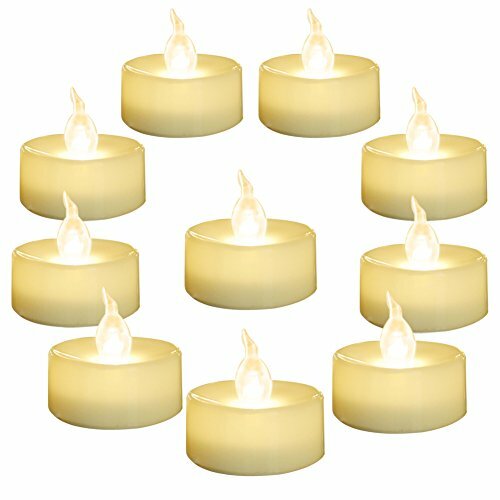 ►WARM AND ROMANTIC ◄: These flameless flickering LED tea lights can create warm and romantic atmosphere and can be widely used to decorate Home, Bars, Hotel, Parties, Birthday, Holidays, Wedding, or other occasions. ►REALISTIC APPERANCE◄: Top-notch Materials are Used to Replicate the Feel and Look of Real Candles. Absolutely no Mess, no Dripping Wax, no Smoke. The flame Stimulation Technology Makes These Candles Sway and Flicker Beautifully Like Real Candles. ►EASY TO USE ◄: Diameter 3.7cm/1.4inch; Height 3.2cm/1.25inch. Pack of 24. On/Off switch for easy & convenient operation. The electric fake tea lights come with batteries which have 100+ hours of light-time and can be replaced easily via the tab at the bottom. ►SAFE FOR KIDS, SENIORS◄:Without fire, smoke and These LED small tea light can be used without having to worry of flame, absolutely no fire hazards or burning risks, safe for families with pet(s) or young child(ren). ►100% SATISFACTION GUARANTEE ◄: All the flameless tea lights are thoroughly and rigorously tested and sold exclusively by Homemory. Each defective unit will be replaced with one dozen LED tea light or a full refund. If you have any problems please feel free to contact us. We will offer you satisfactory solutions.